The DC Universe has been in a state of rapid change since the conclusion of the Dark Nights: Metal event. The Source Wall at the edge of the multiverse is broken, allowing threats to emerge that have continued this cosmic transformation. 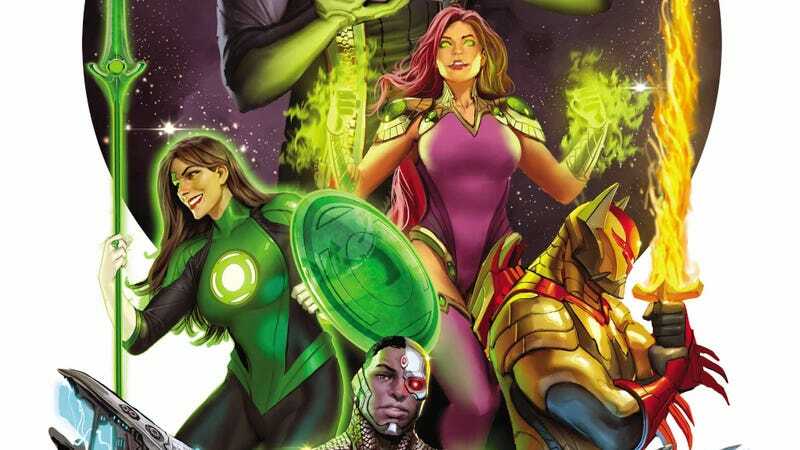 Justice League Odyssey is a new series taking a group of heroes into the Ghost Sector, a territory populated by worlds that had been bottled up and imprisoned on the planet Colu. The destruction of Colu in the Justice League: No Justice miniseries has unleashed these forgotten worlds, and writer Joshua Williamson and artist Stjepan Šejić bring together members of DC’s various superteams to explore this new frontier in Justice League Odyssey. This series has had a rocky road to publication, with the first issue delayed two months when DC decided to reconceptualize the title despite already having an entire issue of artwork completed. Redrawing the book delivered a major blow to Šejić’s schedule, and he’ll only be on Justice League Odyssey for two issues. This is a pity because a major aspect of the series’ appeal is seeing Šejić imagine a new corner of the DCU, but at least he gets to set the aesthetic and tone with these initial two chapters. This exclusive preview of next week’s Justice League Odyssey #1 shows how well Šejić handles the blockbuster spectacle of Williamson’s script, with its dramatic narration setting up stakes that put the entire multiverse in danger. Šejić’s vibrant digital painting adds a lot of energy to the page, and he brings a sense of neverending cataclysm to the Ghost Sector with backgrounds that show planets smashing into each other as they hurl through space, untethered to any sort of orbit. The explosive setting makes the introduction of Green Lantern Jessica Cruz all the more powerful, and Šejić’s bold composition plays a big part in giving this Odyssey an epic feel.